With the proven protection of Gore-Tex®, and the warmth of premium goose down, the Fissile is the warmest Arc’teryx jacket for freeride skiers and boarders. 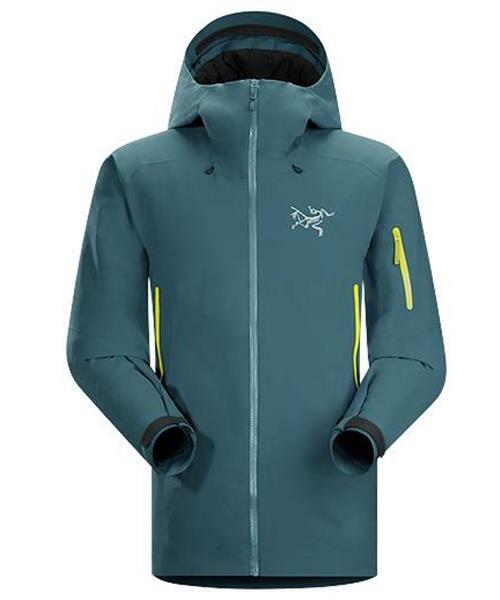 Its level of insulation and weather protection makes it ideal as a warming piece for rest and transition periods on ascents and traverses, then as a protective shell on descents. The breathable N70p 3L Gore-Tex® fabric with tricot technology seals out snow and wind. The fabric is supple, quiet and moves easily with the body. The Relaxed fit allows room for layers, and ski specific articulation elevates freedom of movement. Lofty 750 fill power goose down provides lightweight warmth, with panels of Coreloft® synthetic insulation used in areas where moisture may occur. Down Contour LT™ is paired with Down Composite Mapping™ to improve insulation efficiency. Down Composite Mapping™ is used to place insulation in areas that will maximize benefits and improve freedom of movement. Down Contour LT™ involves the construction of a down filled nylon taffeta inner placed inside the Gore-Tex. This integrated down liner allows for a completely seam sealed shell, provides maximum compressibility, and elevates thermal efficiency by focusing the down closer to the body. Freeriders find their lines by any means necessary, so the Fissile uses purpose specific features that improve performance and versatility without adding unneeded weight of bulk. On cold descents or in foul weather, the insulated helmet compatible StormHood™ provides protection and warmth without sacrificing visibility. On uptracks or strenuous descents, the ingenious mesh backed PowderGuard™ vents under the arms dump heat without accumulating snow. Hand pockets stow essentials, a zip pocket on the sleeve is easily accessible with a pack or harness on, an internal security pocket protects a wallet or smartphone, and internal dump pockets handle gloves, skins and a toque.